EUR is getting weak due to Germany and Eurozone data, the preliminary Eurozone GDP and the Eurozone Economic Sentiment. 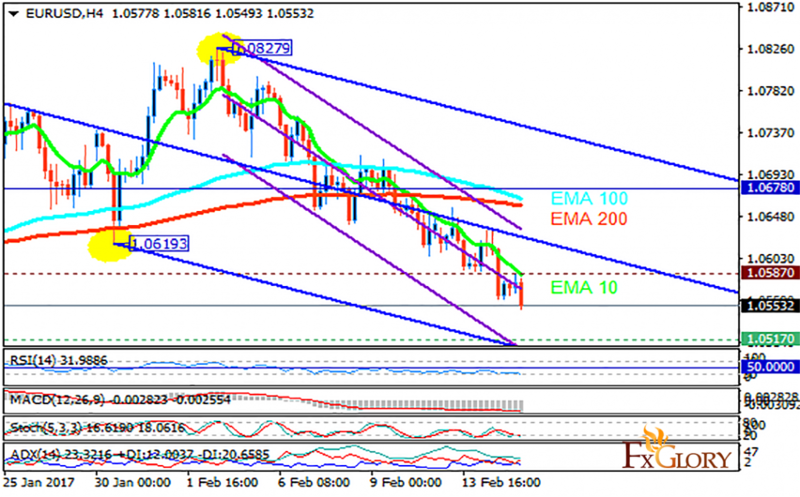 The support rests at 1.05170 with resistance at 1.05870 which both lines are below the weekly pivot point at 1.06780. The EMA of 10 is moving with bearish bias along the descendant channel and it is below the EMA of 100 and 200. The RSI is moving in oversold area, the Stochastic is moving in its low ranges and the MACD indicator is in negative territory. The ADX is showing a weak buy signal. The pair is falling within Andrews’ pitchfork however it might not go lower than 0.05350 therefore the short term sell orders are recommended.